Infinite Protect Hair Dryer is rated 4.8 out of 5 by 38. Your drying experience will never be the same with our Infinite Protect Hair Dryer whether you are after a fresh blow-dry or a super sleek style. The hair dryer gives you the confidence to style with the unique Infinite Protection Technology that helps protect your hair for long lasting vibrancy & shine. With an intelligent sensor that continuously reads your hair temperature and adjusts the heat, the hair dryer ensures your hair never rises over 85°C. An Advanced Ceramic coated grille that transfers micro-conditioners infused with Shea Oil & U.V. 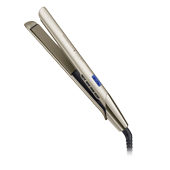 filters provides extra protection to your hair as you blow dry. 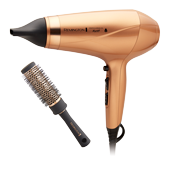 The hair dryer also features 3 heat, 2 speed and ture cool shot switches, 7mm and 11mm concentrators to control airflow as well as a diffuser to keep your curls looking vibrant and shiny. 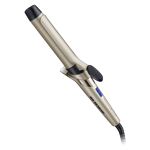 Rated 5 out of 5 by Mwild from No hair damage Bought this hair dryer because I has having issues with my hair dryer damaging my hair. This one works great. No hair damage and is fairly lightweight. Rated 5 out of 5 by Roberto from Powerful This nearly blew my wife's wig off. There's other settings if course but that one is good fun. Infinite Protection Technology helps protect your hair for long-lasting vibrancy & shine. Introducing the latest addition to the Keratin & Argan Oil Nourish range.